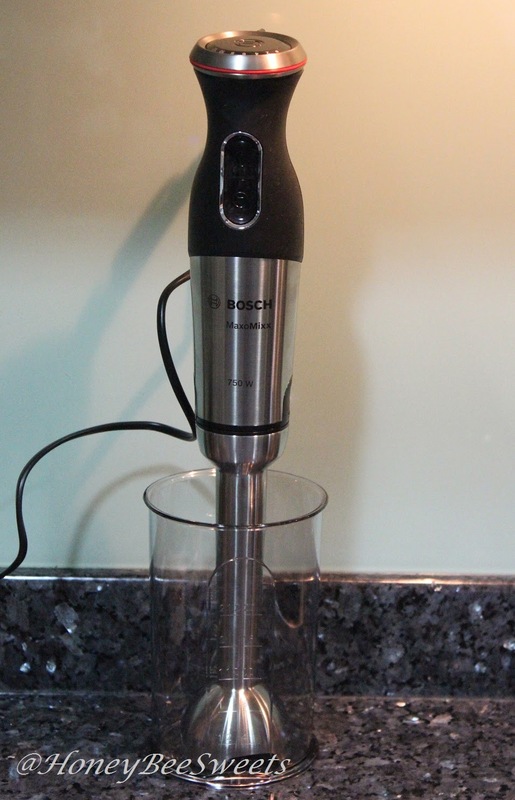 Recently I had the privilege to receive Bosch's MaxoMixx handheld blender to review. In my previous post Brown Butter Wholewheat Pecan Banana cake , I whipped up this delicious cake using the whisk attachment of MaxoMixx blender. 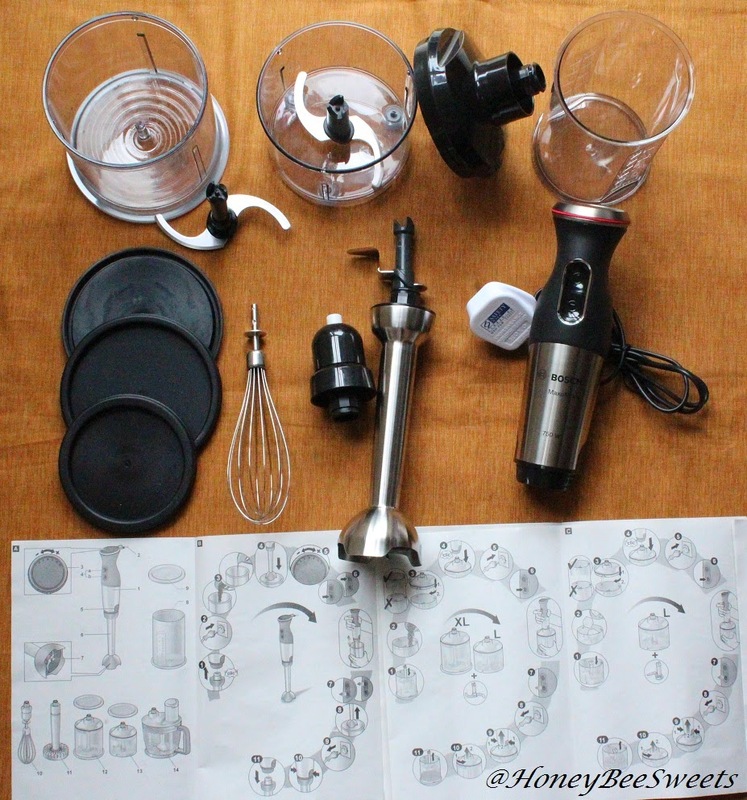 (See below for the various attachments) As I mention before, MaxoMixx ain't your usual one function handheld blender which only pulverized your chunky soup. 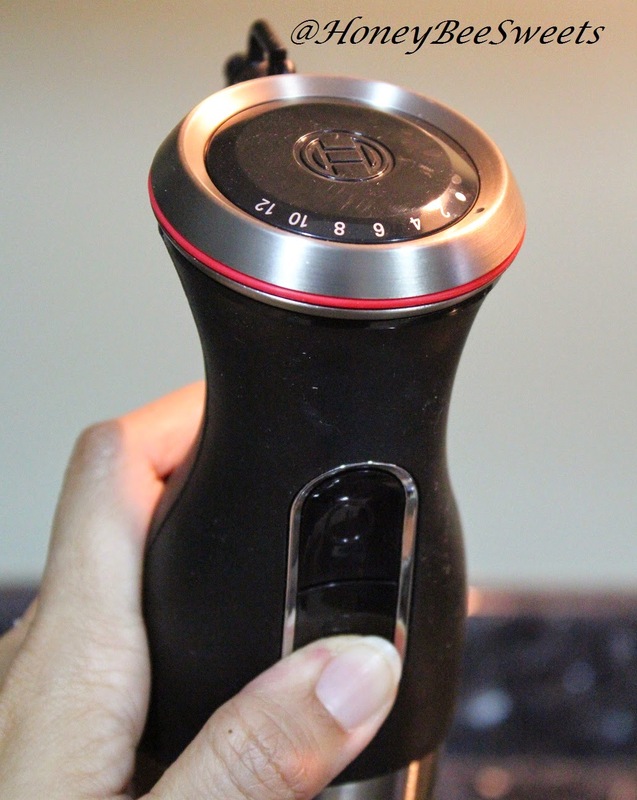 It has up to 5 different functions that will slice, chop, blend, mince and liquified your food the way you want it to be. You can see from above, those are basically all the things in the whole package. Not that complicated so far. Usually I'm plain lazy to read up the manual but luckily the instructions available in the package has clear pictorial format, yay! It basically shows you which parts can be attached to the other. All very clearly labelled too, cool. :) I bet even my 8 year old kid can put this together. 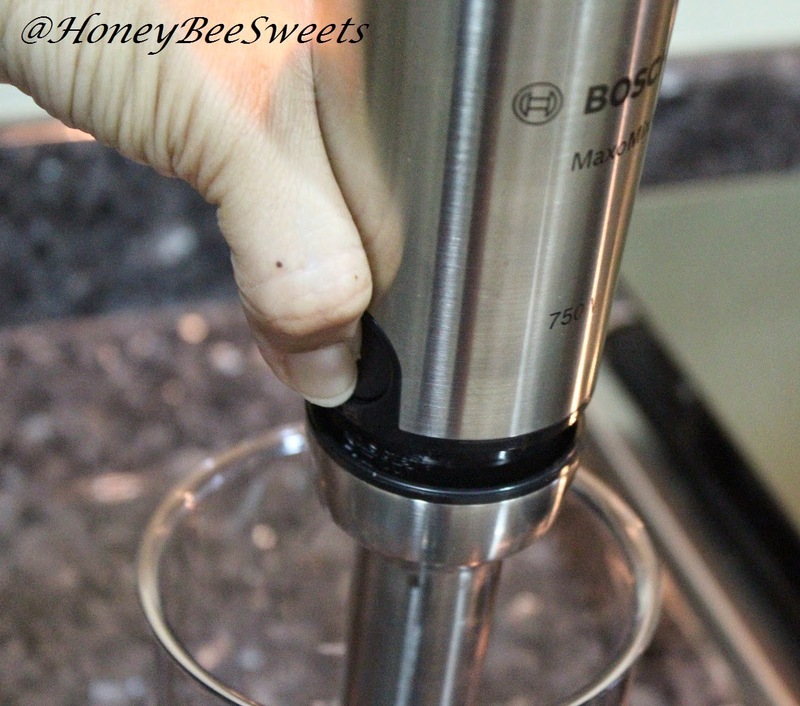 It is really easy to attach or detach the base unit from the Blender Foot. You just have to give the release button a firm press on both sides and pops it comes off. Here is a look at the four-winged Quattro blade stainless steel foot. The blades might looks short and small, but it packs a whole lot of power! This is also MaxoMixx's key feature which makes it more powerful and stronger then other well known brands. Which we all know that most of the other handheld blenders only has 2 or 3 wings. I guess in this case, the more the merrier right? There is actually two mode for the blend, normal and ...turbo. So far so good, no rocket science here. I love for the fact that the blender jug given is actually tall enough which allows ample room for your food to blend nicely without spilling out. And there's more! 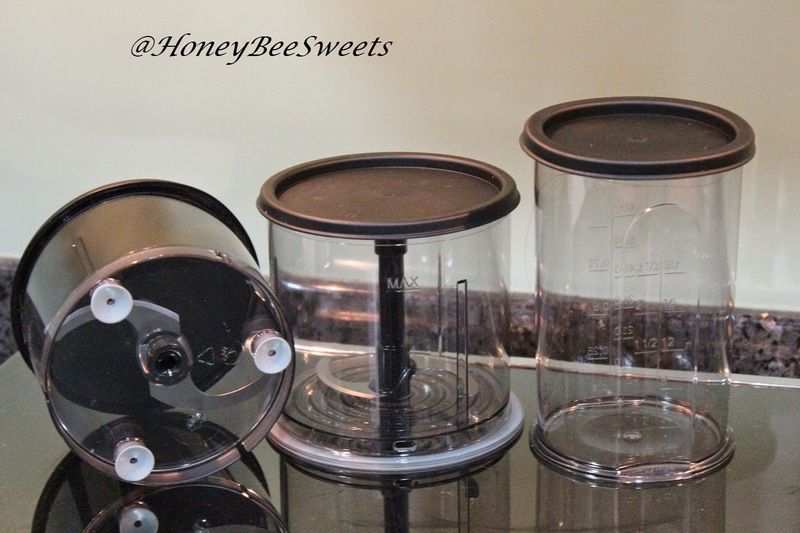 Check out the suctions at the bottom of these containers for the Universal cutter "L" and "XL". These suctions will most definitely help hold the container when it blends...cool! And yes, it comes with its own lid for easy storage too. That is definitely a plus! Note that there is a blade each in these left two containers. So when we attach the base unit to these containers, they operated just like a blender which can crush ice (wow! ), cut meat, hard cheese, onions, herbs, garlic, fruits, vegetables, nuts and almonds. Did you say Almonds? I was stoked when I saw the word Almond! What better way to get "acquainted" to your new tool then to actually try it out and put it to the test eh? Almond butter it is! 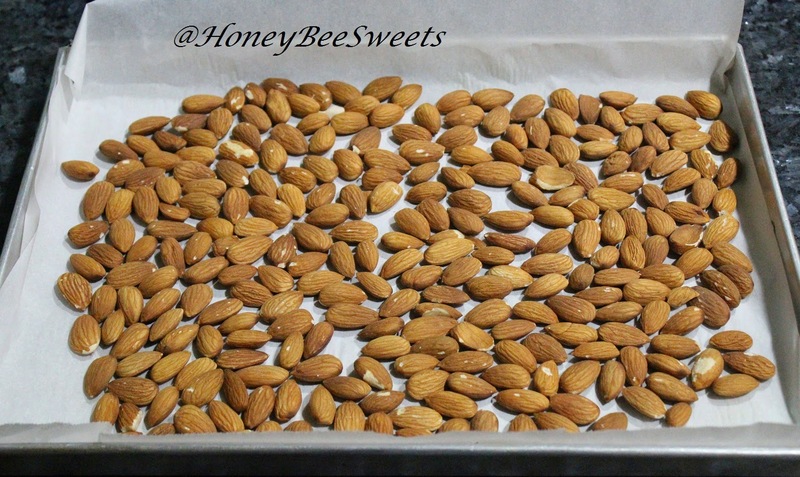 Once the almonds are nicely roasted, let them cool down before using them. 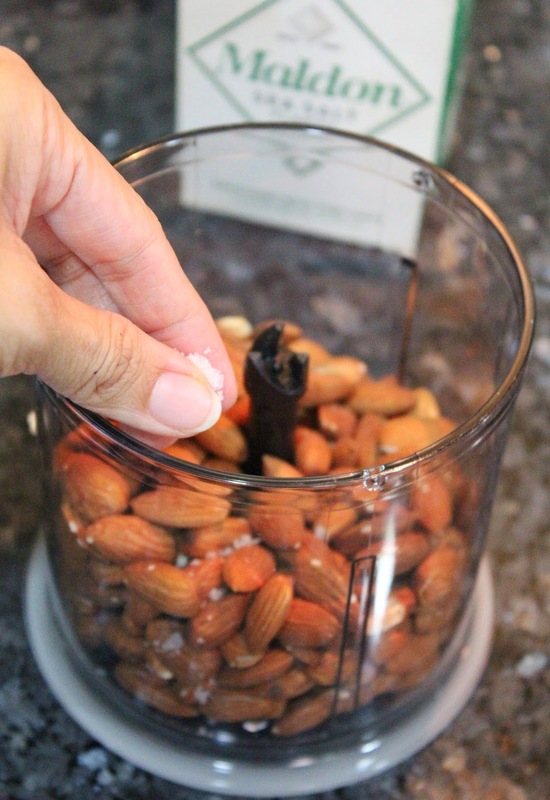 Place the cooled roasted almonds into Universal Container XL and sprinkled a good pinch of flaked sea salt inside....or any salt will do too. Cover up, attach the base unit and give it a whirl! See how it has become creamier? At this point, you will feel that the base unit of the MaxoMixx is slightly warm to the touch. I suggest giving a 30 secs to a minute "break time" for the blender before continuing. At least that was what I did...you don't want to heat up the blender too much. In fact its never a good idea to over heat any of your home appliance! So there you have it...creamy almond butter! At this point, IF you wanna make the butter even smoother and don't mind the additional of small amount of oil, you can add 2 tsp of sunflower seed oil or peanut oil to the mixture and blend another 10 seconds. These 2 tsp of oil will make the butter really smooth! 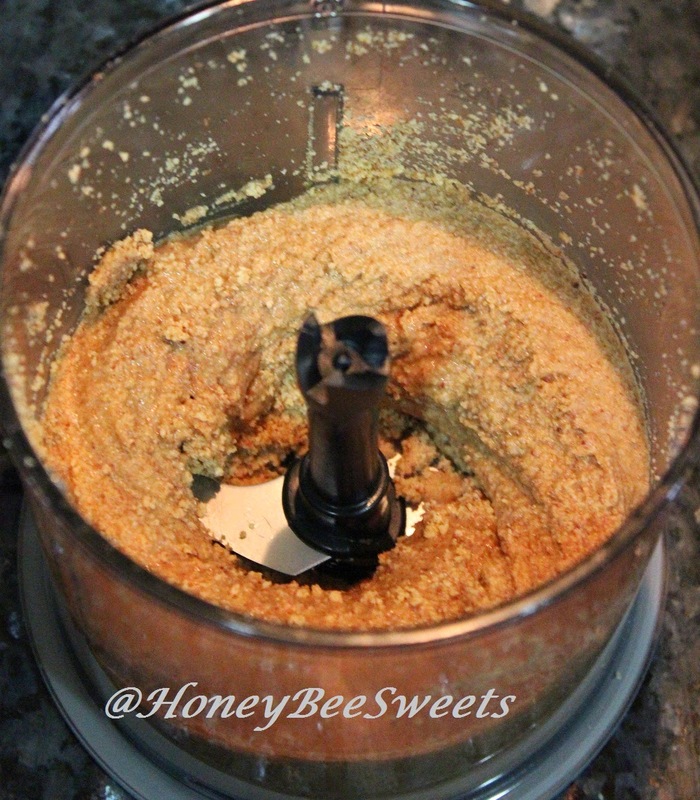 And if you like it slightly sweetened, add 2 tsp of honey to make Honey Almond Butter....yum! 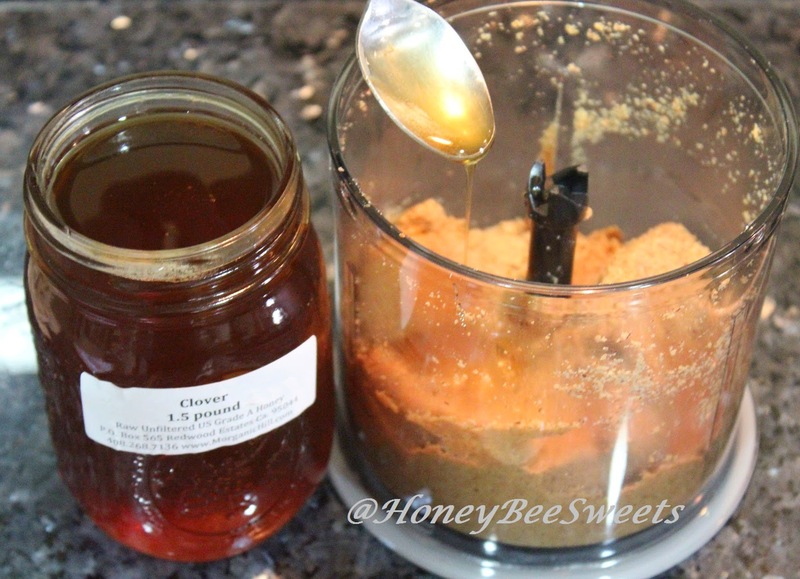 I added wild Clover honey which I lugged back from California a couple months back, heehee! Blend another 15-20 seconds and you are done! Feel free to substitute with other form of sweetener, powder sugar, brown sugar or maple syrup. 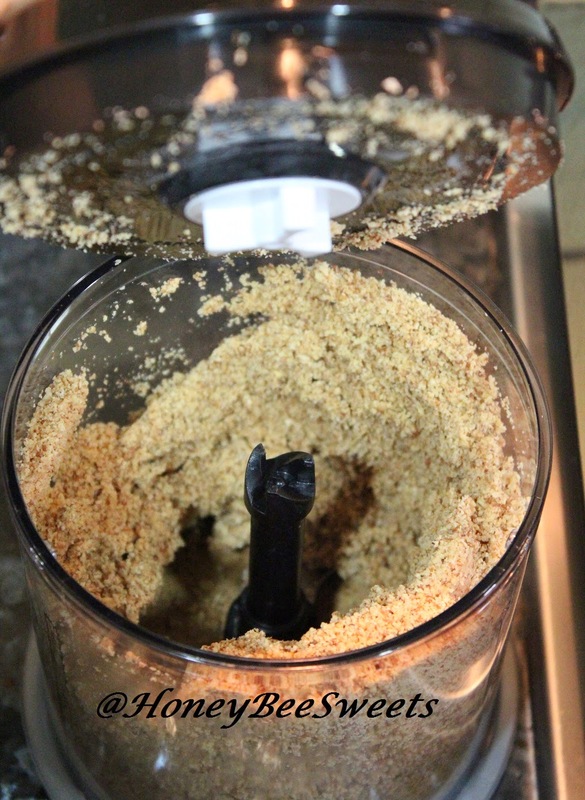 I suggest doing small batches of 300g, maximum 350g each time for making nut butters. So that the MaxoMixx blender doesn't over work or get heated up too much. Make sure to give the blender a 1 minute break between each 3 to 4 minutes blending. Yes, love your appliances and it will last longer. 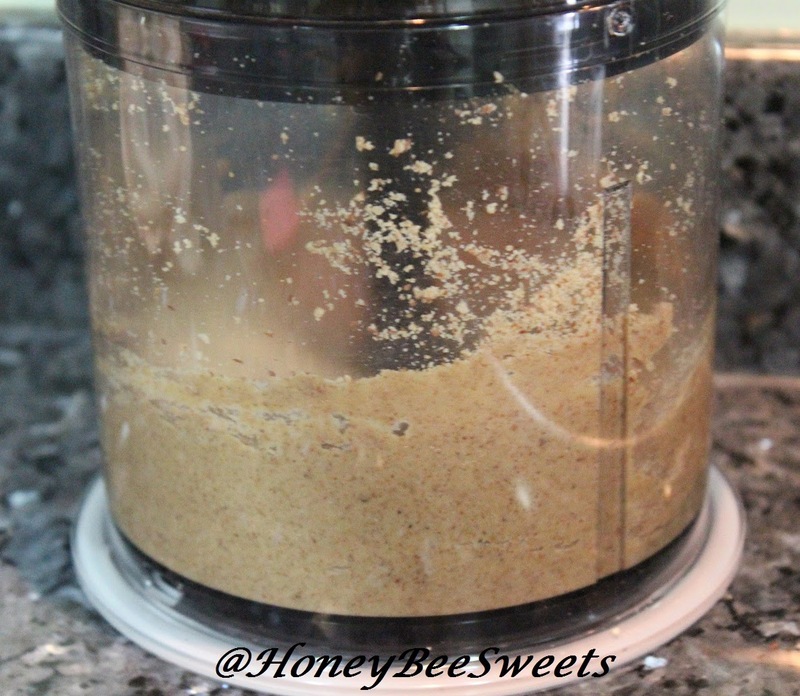 Well, thanks to MaxoMixx, this almond butter making process does seems a whole lot easier! And I am glad that MaxoMixx was so easy to use too. Plus cleaning up was a swift. I only had to wash the Universal Cutter XL container and blade. 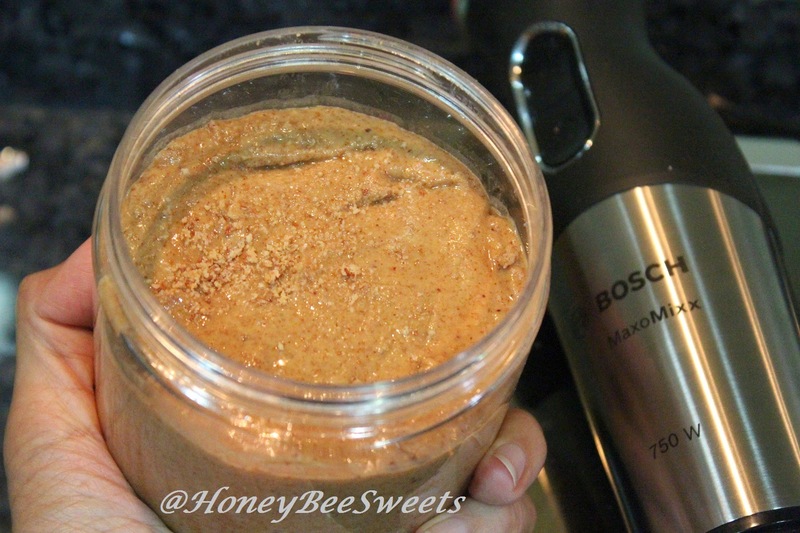 Plus my first ever homemade Honey Almond butter tasted so creamy and delicious! Never will I buy another off the shelf bottle of almond butter ever again! Yay! With the Honey Almond Butter I made, I also whipped up some Honey Almond Butter Milkshake! So simple and yet so healthy and satisfying. Here is the recipe, try it! 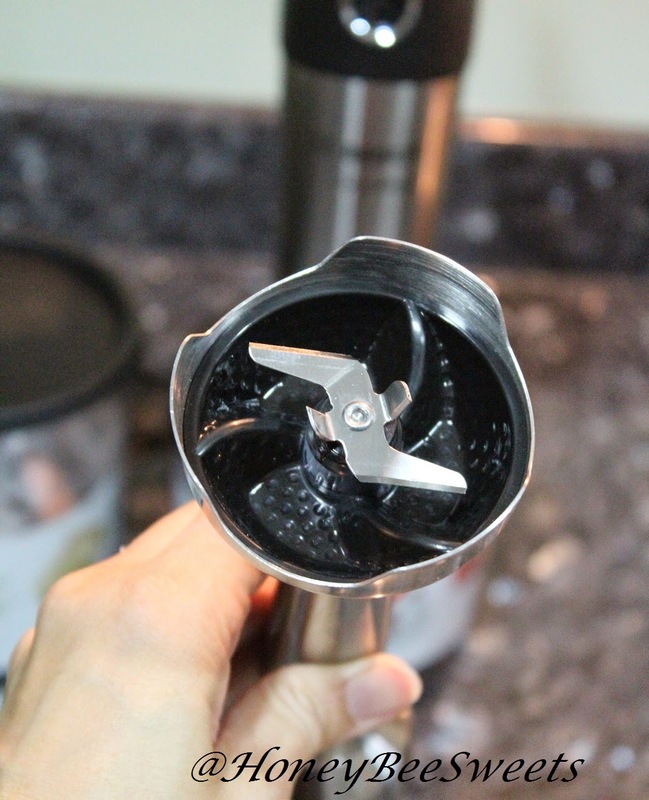 Place everything in the blender jug, then insert the MaxoMixx Base unit attached to the four-winged Quattro blade stainless steel foot...and blend! When smooth and creamy, its ready! Drink up! Keen? Do try out these recipes, especially they are so simple. 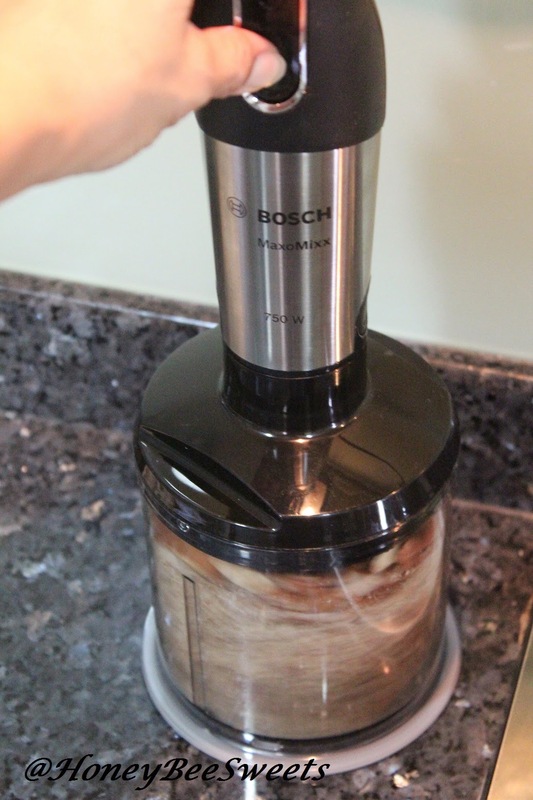 Or perhaps a MaxoMixx blender too to help your almond butter making easier? Haha! I am already looking forward to trying out more recipes using MaxoMixx blender. Stay tune guys! In the meantime, have a good day ahead guys!